Well, the unfortunate news is that the last round of chemo did not reduce the tumor. It actually grew some more. That was very disappointing to say the least. What made it bearable at some level is that Elle continues to have a ton of energy and vigor. She is chasing the cats, demanding that books be read to her and eating hamburgers like it was going out of style. That said, we have another chemo combination to try. We are introducing a new drug here called Vinorelbine. It is related to the Vincristine that Elle has received so many times. You may be asking "What makes it different?" I really don't know, to be honest. But we are combining it with our old friend Cyclophosphamide, but in a pill form and in a lower dose. So why use a drug that didn't work the last time we used it? Apparently there is an emerging body of literature that suggests that combining it with the Vinorelbine can be effective against cancer types like Elle's. It's like drinking gin. You mix it with chocolate milk and it tastes like crap. But mix it with OJ and you have an Orange Blossom. The gin isn't any different, it just works better with something else. Obviously, we're hoping that this is the Orange Blossom of chemo treatments. The other good thing for Elle is that this treatment takes relatively little time each day. The Vinorelbine is a push through her line and the Cyclo is in the aforementioned pill form. It will take all of 10-15 minutes each day for her to get the treatment at the clinic. This pleases Elle immensely. 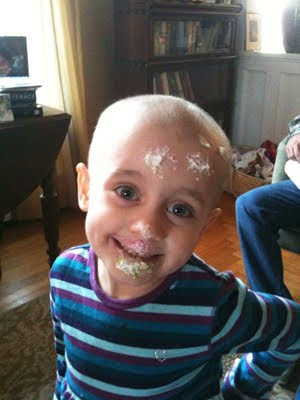 There may be some form of chemo next week as well...that has yet to be determined. But we now have another plan and we are forging forward. Unfortunately, the Temodar/Iriniotecan treatment did not work. In fact, the tumor slightly grew again. Combined with the fact it grew in a place close to major vessels that supply the heart with blood, the surgeons feel that surgery isn't possible at this time. Until it shrinks in size, they wouldn't be able to remove all of it. And with the long recovery time, that would just allow what was left of the tumor to grow once more. So it's another round of chemo. We are going to back to one of the VAC drugs, Cyclophosphamide, and a new one called Topotecan. Hopefully, these will restart the shrinkage of the tumor. And we are now discussing radiation treatment as well. This is very disappointing to say the least. But Elle is still unflappable in her attitude and that helps quite a bit. One other thing; if you can, pray for her. And ask your friends to do the same. I think that the power of prayer and positive thoughts is always something worth tapping into.